Funding secured? That implies lawyers have all the contracts in place to make this happen. Elon disguises his clever plan to take the company private as a rash judgment on Twitter. There is no way he didn’t ask his team of lawyers if he could tweet that. So that is that. The end of public shares of TSLA (for now)? If TSLA goes private, short sellers do what? If the vote goes through, the shareholders have the option to keep their shares or trade in for $420. Short sellers will have no other option but to cover which they would be smarter to do sooner rather than later. 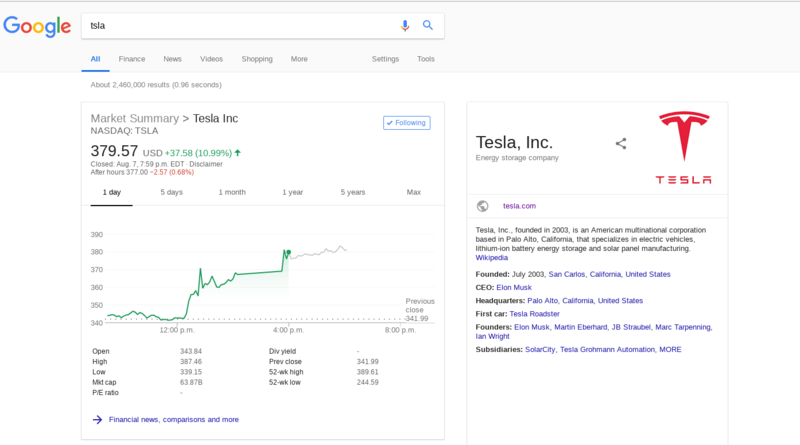 Why is the price of TSLA stock currently @ $380 instead of $420? Doubt. And that is not a good reason. Elon Musk is going to put a shareholder vote through to convert public shares to private shares. He will do this, I am 100% certain. This will be one of his easiest achievements. A vote will take place to buy TSLA for $420. It will likely pass. This means you can buy shares right now at $380 and trade them in for $420 in the very near future. What could happen though? What if TSLA goes beyond $420 for publicly traded shares? What if TSLA goes to $500? If this happens, then shareholders could vote down the decision to go private @ $420. We know what Elon is going to do. He is going to use his 20% of the votes to make it happen. That means more than 62% of the remaining votes have to be so awestruck by the current stock price (and show up for a shareholder vote) to sway the decision not go private. Not likely to happen unless the price of the stock is so high that even Elon changes his vote as well. From my standpoint, TSLA goes higher no matter what. Worst case shares will be bought at $420. Best case, the shares get so ridiculously high that shareholders turn it down. So here we go. The resistance should be bailing out and maybe even getting back in long. If they hurry, they can recover ~10% or maybe even ride the wave beyond. Perhaps Elon was hoping the Q2 results would be enough to drive out the shorts. Perhaps this is what he had in mind all along. Perhaps there is more to come. It is an exciting day to be TSLA long and hold TSLA options (like me). Enjoy the ride.